VIA Rail’s flagship train, the Canadian, is a legendary three-day, four-night rail experience between Vancouver and Toronto across some of Canada’s most spectacular landscape. 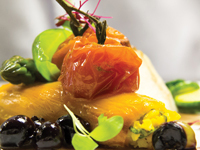 Delicious onboard fine dining has always been a big part of the experience, as travelers can enjoy the rare opportunity to dine surrounded by unforgettable images of the Rockies, the Prairies, forests and lakes during their memorable journey. 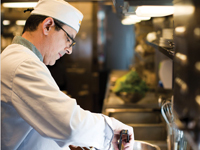 This experience has recently been enhanced with the creation of a new menu on the Canadian by Executive Chef Martin Gemme, and seven other VIA-Rail chefs. This adventure started last December when Gemme issued a menu creation challenge to VIA’s head chefs. Starting with an impressive selection of Canadian ingredients, chosen by Martin himself, the chefs had to put together a multitude of recipes. Ultimately, a delicious menu of local flavours emerged. To put the new menu to the test, VIA then invited five Canadian food bloggers to come and taste the freshly invented culinary creations served aboard the Canadian. As unconditional lovers of fine cuisine, these bloggers, known as “foodies”, travel the world in search of different and delicious dining experiences. The foodies came away impressed with the Canadian’s new fare. “What the chefs ended up with was an array of made-from-scratch dishes using fresh Canadian ingredients”, wrote Reader’s Digest food editor Valerie Howes in her blog, Readers Digest Open Kitchen. Dustin Gilman of Montreal, who writes two food blogs, Food Guy Montreal and Street Food Montreal, wrote that he didn’t expect this level of cuisine on a train, but boy did they deliver. “In short: the food was excellent. I don’t know many trains, buses, boats, or airplanes where you can get duck confit eggs benedict for brunch, shrimps and scallops with a local (yes, I said local) Saskatoon berry chutney for lunch, or Canadian lake trout in horseradish and panko breading with ravigote sauce”, he said. His favorites included “the AAA Canadian prime rib of beef, served with a rich rosemary demi-glaze and stuffed potatoes, cheesecake-stuffed French toast with a wild berry compote and whipped cream, and the slowly braised beef short rib with pearl onions and bacon in a thick stout beer sauce”. Every dish for lunch and dinner has a recommended wine to pair with it where each selection is from Ontario and British Columbia. The delicious new menu can now be enjoyed when travelling in the Canadian’s elegant Sleeper Plus class which includes a bon-voyage reception, onboard fine dining, accommodations and VIA’s renowned attentive service. More information on the Canadian is available at www.viarail.ca.